While few of us will run for office, those of us in business or professional life often need to “campaign” for funding, endorsements, or promotions. To advance our cause, we need to become dynamic speakers. Overcoming public speaking anxiety isn’t rocket science requiring clinical interventions. People who are motivated can become more self-confident speakers if they work with a specialist who knows how to read audiences and make adjustments to the speaker’s style. Using a professional is important for women who want to advance their careers or causes because women have to overcome sexist attitudes about their capacity for leadership. Today’s headlines remind us that the playing field is far from level. In any area of human endeavor where men hold the lion’s share of power, from Hollywood to the STEM fields, sexual harassment is an obstacle to women’s advancement. We know that women hold only 19.9% of board seats at S&P 500 companies. It’s shocking that women are only 21% of the members of the US Senate and only 19.3% of the US House of Representatives. Throughout US history, brilliant women who have dared to have big ideas have suffered mockery, derision and tangible punishment. There is no doubt that Hillary Clinton advanced the cause of women in politics. By the end of the 2008 primary, 18 million people voted to nominate a woman for President of the United States, which was impressive. And, let’s not forget, in the 2016 Presidential campaign, 65,844,954 people voted for Hillary – 2.8 million more votes than Donald Trump received. She did something amazing for women. It’s possible that the feedback Hillary received about her speaking style was only from close loyal friends or trusted family members. It would have been difficult for them to provide honest feedback, especially at a time when they were distracted by the fast-pace of the difficult campaign. And they would have been loath to add to her stress even after she delivered high-impact speeches, some of which left her feeling euphoric. 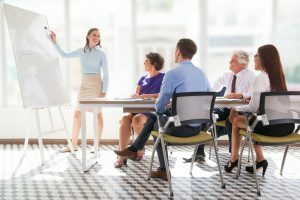 She would have been better off working with a specialist – such as a public speaking coach – to debrief her after each presentation and focus on one or two style issues to improve her overall LQ. First, Hilary often sounded scripted. A neutral speech coach would have addressed this issue immediately. Perhaps she was overly cautious in wanting to address the archaic stereotypes about women’s capacity for leadership, and, therefore, held back that conversational tone and humor described by people who heard her speak in smaller groups. She seemed intent on projecting the gravitas of a Commander-in-Chief, and historically, that has always been male. Businesspersons with a fresh idea, like political speakers, must build people up, remain optimistic and demonstrate a “can-do” attitude. Whether you have a product to fund or an election to win, ask yourself how you visualize your campaign. Do you have a graphic logo and a memorable slogan? Look at what Hillary did to reinforce her candidacy. 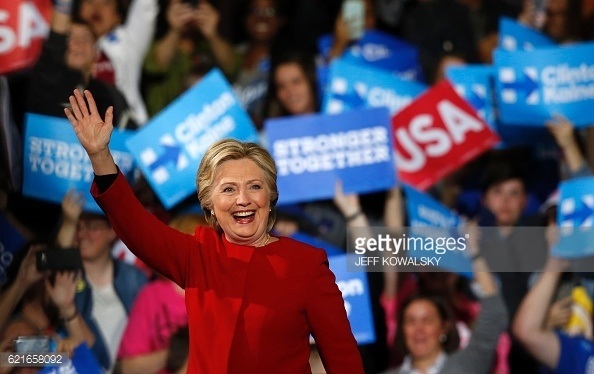 The easily identifiable red “HILLARY” became a symbol of her campaign. Using a candidate’s first name wasn’t new, but in Hillary’s case, the branding was intended to convey that she was her own person, separate from Bill Clinton. To counteract Trump’s criticism that she was elitist, she created the aura with the “HILLARY” brand on T-shirts, mugs, and banners conveying that she was a regular, approachable person – a mother, grandmother, and even a friend. “I’m With Her” conveyed camaraderie and community. To counteract criticisms that she was frail, Hillary conveyed power and energy by wearing red during the debates and whistle stops. (even though red was the color of her opponent’s party). And the color red sent an unconscious message. Psychologists say the color red leads men to view women as more attractive and sexually desirable. Some hypothesize that humans may be conditioned to associate the color with fertility. Hillary’s meta-message: don’t underestimate a 68-year old woman! ​Lesson Learned #1: Stick to a single, coherent narrative that resonates with voters and decision-makers (but vary your style so each distinct audience can relate to you and your ideas). Be sure that anecdotes and self-effacing humor are in service to that narrative. ​Lesson Learned #2: Remember to be the same likable, humorous person you are in small group settings. 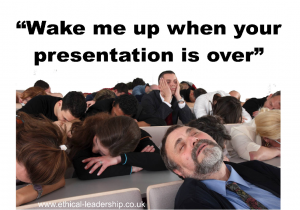 This is especially important when making speeches to large or formal audiences. ​Lesson Learned #3: Explain complex ideas or schemes as simply as possible and in a conversational tone. Your listeners might not be technical specialists, math wizards or wonks. Paint a picture of the future that is vivid, and describe the benefits of your pitch in a fresh, interesting way they will remember. ​Lesson Learned #4: Address the issue of trustworthiness upfront to ensure you are seen as a credible leader. You may the “first” person of your group to seek a top position so there will be skeptics. Do so with empathy and respect for your listeners’ point of view. Lesson Learned #5: Decide on and control the narrative. Take the high road when you receive criticism but always stay on message and assert your brand consistently. While being candid about your own missteps and life lessons, consistently emphasize that you can do the job! Lesson Learned #6: Remind yourself: “This isn’t about me.” Each audience is different and unique with different concerns. Ask yourself: How can I help them achieve their goals? How is my big idea going to lift them up? When it comes to delivering high– stakes, impactful presentations, it’s important to take nothing for granted. Check your assumptions at the door regarding whether which listeners will support your big idea. It’s always “Game On” when you’re pitching a new idea or your candidacy. Each person has more than one agenda and the naysayers may wage an effective negative campaign. Work the room and keep working it – whether it’s the boardroom or the staff room. Keep your brand in front of people and keep them excited about your proposal. In spite of the advances that have been made, Hillary’s defeat – and the personal ways in which she was mocked and derided – is a reminder that women still have a long way to go in winning the White House. But I believe that even someone as accomplished as Hillary could have benefited from adding a public speaking coach to her team of strategists in winning over the on-the-fence voters. 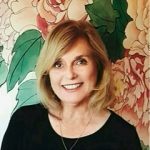 Lois Phillips is a dynamic public speaker whose clients say she “practices what she teaches.” Her academic background combines with executive experience to inform her training and coaching. Using principles gained from interviews with successful speakers and outlined in “Women Seen and Heard: Lessons Learned from Successful Speakers” she provides coaching and training to spokespersons, managers and executives. Dr. Phillips has a special interest in executive and professional development, strategic planning, and Board leadership. She has produced conferences on women’s leadership, moderated two television programs about the changing roles of women and men, and has delivered numerous keynote conference presentations. For many years she presented workshops to corporations on the subject of PREVENTING SEXUAL HARASSMENT IN THE WORKPLACE after providing climate surveys of the corporate culture. So very well written, Lois! I am forwarding this to many friends because your wise words need to be a part of our daughters and their daughters beliefs.